The following article was written by Benny Wenda, Chairman of The United Liberation Movement for West Papua (ULMWP), following the release of West Papuan political prisoner Yanto Awerkion. The article was originally published here. As the world celebrates Easter Sunday, in West Papua we are also celebrating the long-awaited release of our brother Yanto Awerkion, a political prisoner who faced a 15-year jail sentence for “treason” just for supporting a petition. Under Indonesian law, people in occupied West Papua can get a life sentence or worse for expressing their desires to be free. 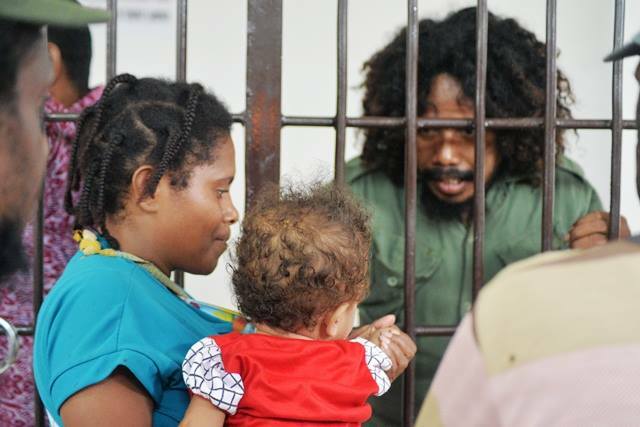 Yanto Awerkion seeing his wife and one-year old baby daughter through prison bars, right before his trial. Yanto Awerkion was arrested on 30th May 2017 at a prayer gathering in the town of Timika after publicly speaking in support of the West Papuan People’s Petition to the United Nations. This was no ordinary petition. It was a petition hand-signed by over 1.8 million West Papuan people. Petition sheets were smuggled from the mountains to the coast, signed in cities, villages and jungles by pen, fingerprints and even by blood. It was signed by over 70% of the indigenous West Papuan population. Why did the Indonesian authorities jail Yanto and arrest 57 and torture 54 other people because of the petition? This petition spoke from the very heart of the West Papuan nation. It was a petition which called for our fundamental human right to self-determination to be exercised in an internationally supervised vote – a referendum on independence. In the eyes of the colonial Indonesian government that is treason. They set about systematically arresting and torturing anyone found involved in its mobilization. As a local leader of one of the biggest civil resistance organisations in West Papua, Yanto Awerkion was singled out as a ringleader and his committee’s headquarters was stormed by armed Indonesian military and police. 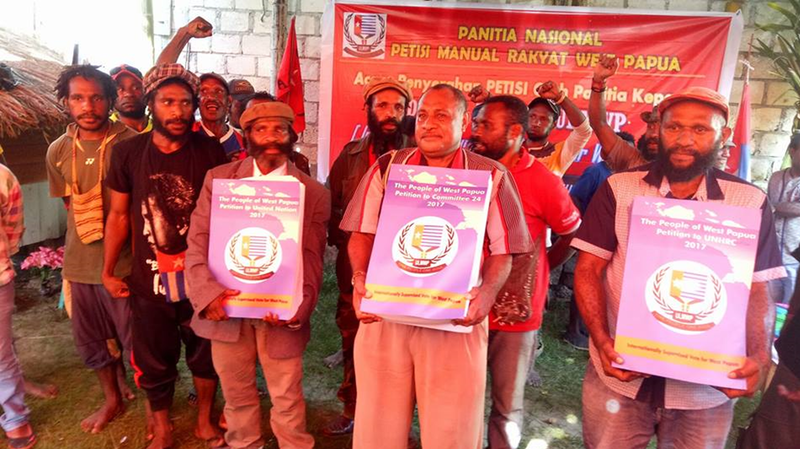 Representatives of The United Liberation Movement for West Papua (ULMWP) with finished copies of the West Papuan People’s Petition. Photo: ULMWP. West Papua is a prison not province of Indonesia. In West Papua, we call prisons like the one Yanto was held in “little prisons” but West Papua itself the “big prison”. West Papua is a prison not a province of Indonesia. When Indonesian illegally occupied West Papua in 1969, our fundamental right to self-determination was systematically violated by Indonesia in the ironically named “Act of Free Choice”. Despite UN promises of an independence referendum, the Indonesian government forced just over 1000 people at gunpoint to declare their support for Indonesian rule and threatened to mutilate and kill anyone who did not. 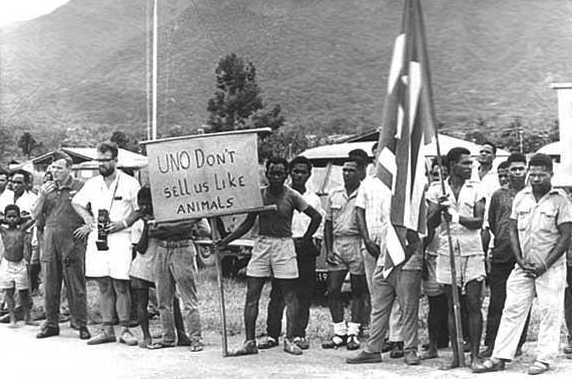 West Papuan people in 1962, just before Indonesia’s invasion of the country, calling upon the United Nations not to “sell us like animals”. Today we are a 21st century colony of Indonesia and are still under illegal military occupation, suffering a systematic slow-motion genocide just like the people of East Timor suffered. Human Rights Groups estimate that some 500,000 West Papuan people have been killed, ever since Indonesia illegally took control of West Papua in the 1960’s. For the Indonesian government, ownership over the world’s biggest goldmine is at stake. For us, what’s at stake is our very existence as a people. As a former political prisoner in West Papua myself, I know what it’s like to suffer behind Indonesian prison bars, not knowing whether I would ever see my family again. I found hope in international solidarity, in knowing that there were people around the world who cared about me and about what my people were struggling for. It was this hope which gave me the strength to escape from prison in 2003 and make my way to the United Kingdom where I was granted political asylum as a refugee. In 2004 I launched the Free West Papua Campaign, an international organisation dedicated to raising awareness about West Papua’s right to self-determination. 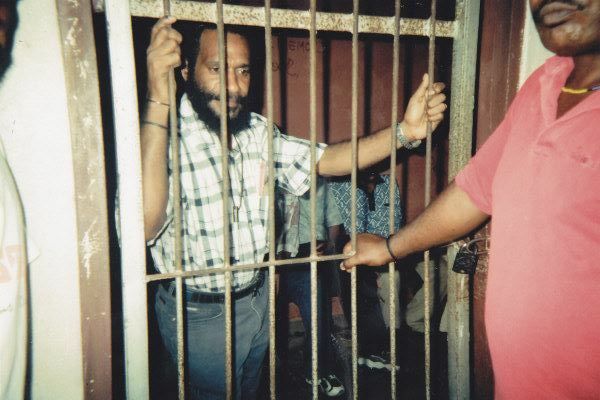 Myself in prison in 2003, facing a 25 year jail sentence for raising the West Papuan flag and leading my people peacefully towards independence. After the historic West Papuan People’s Petition was signed and secretly smuggled out of West Papua, I took it to UK Opposition Leader Jeremy Corbyn, a long-time supporter of West Papuan self-determination. Jeremy Corbyn gave the petition his blessing and was delighted to see it as an historic, grassroots act of democratic expression by the West Papuan population. When I then presented the West Papuan People’s Petition to the United Nations Decolonization Committee in New York, the Indonesian government claimed the petition “did not exist” while continuing to threaten Yanto with a 15 year jail sentence for supporting it. 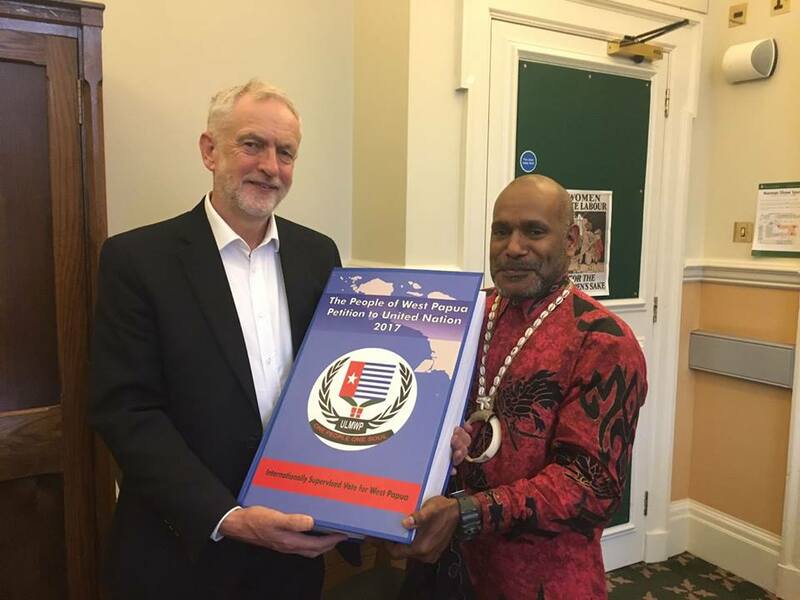 Myself presenting the West Papuan People’s Petition to UK Opposition Leader Jeremy Corbyn. Photo: International Parliamentarians for West Papua). After widespread momentum organised by the Free West Papua Campaign for Yanto’s release, and 17 court appearances later, Yanto was finally sentenced on 12th March this year and given 10 months in jail with time served. 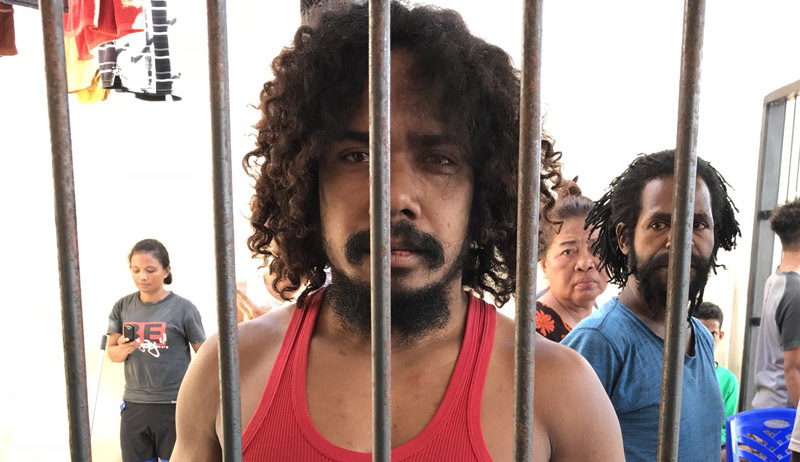 While it is outrageous that he was sentenced at all (especially given the much lighter sentence handed down to an Indonesian soldier for shooting and killing West Papuan villagers in 2017), the lack of the threatened 15-year sentence is testimony to the hard fought efforts to get him out. As he had already spent 9 and a half months in jail, it seems that the Indonesian authorities were too embarrassed to just release him immediately, yet knew they could not lock him up for much longer. Yanto Awerkion being kept behind prison bars. Photo: TabloidJubi. Yanto’s release gives hope to West Papuans, not of a reforming Indonesian government but of the strength and determination of our people, and the far reaching effects of the widespread and growing international solidarity with our cause. Despite all the odds stacked against us and all the Indonesian state repression we are facing, we are continuing to push forward and make great leaps in our long struggle for freedom. Yanto’s suffering and struggle has become a symbol of the modern-day West Papuan resistance. He is a figurehead for the 1,804,421 people who risked their lives to sign the historic West Papuan People’s Petition, demanding that the United Nations fulfill its promises and allow us a free and fair vote on independence at long last. With growing momentum by UN member countries for West Papuan self-determination, the tide is turning for West Papua, and at last we are having our voice and our aspirations for freedom heard by the outside world. So today, we welcome Yanto from the little prison in Timika, to the big prison of West Papua itself. His incredible resilience and courage is a symbol of the enduring strength and spirit of the West Papuan people. Like Yanto, we will not give up until our right to self-determination is finally exercised in an internationally supervised vote. We will not give up until West Papua is finally free at last.